Here's the sweetest scrub for your skin! 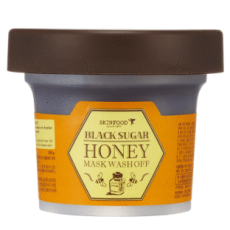 It features organic black sugar granules, that is enriched with vitamins and minerals to nourish your skin while exfoliating dead skin cells and clearing stubborn blackheads. Plus manuka and acacia honey to prevent irritation and keep your skin soft, clear and moist after the scrub! After cleansing, scoop adeqaute amount and spread on damp skin. Massage gently, then rise thoroughly with lukewarm water. Tip: If your skin is too sensitive, add a little bit of water or cleansing oil, then massage on damp skin.